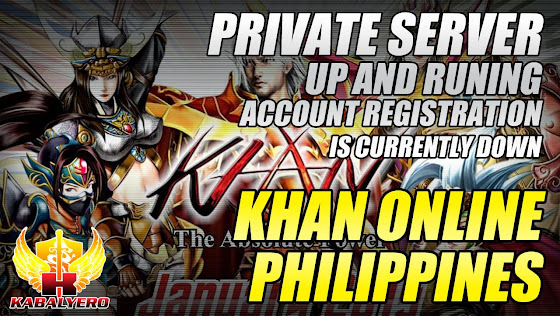 Khan Online Philippines, Private Server, Up And Running - KABALYERO - PLAY, BLOG & EARN! Khan Online Philippines is back as a private server and it's up and running but account registration is down. Khan Online was the next MMORPG that I played after quitting Ragnarok Online. I played in Khan Online Philippines and kept playing until it was closed by the publisher. From what I know about the closure, the game was closed because the developer of the game stopped developing and supporting it. After that I moved on to other games like Cabal Online and others. A couple of days ago, I learned that Khan Online Philippines is back. It's not an official server but a private server run by Blaze Games. As a former Khan Online player, I was interested in playing the game again. So, I downloaded the game client, installed it, upgraded it but, the problem is this, creating an account for the game is impossible. It's impossible because the website is down and has been down for a couple of days now.